Silly Bee's Chickadees: Pie Carumba! Wednesday, I decided to make a few pies. Just a couple. No big whoop. The pie fillings are awesome. I've used them plenty of times before. But, I don't have a go-to recipe for pie crust. That's where it all went south. I blame the Pie Gremlin. He hangs out with that other punk, the Great Pumpkin. 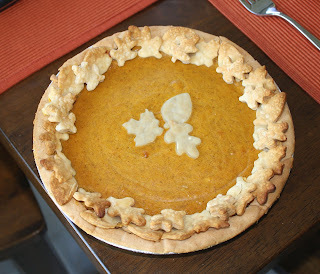 I wanted to make my pumpkin pie all fancy-like, so I rolled out some dough and used the little leaf cutters that I bought with Christy at Sur La Table. Because I was going to add them just before the pies were done baking, I decided to place the little leaves in the fridge. I didn't have any cellophane, so I pulled out some heavy duty foil. While laying a piece of it out on the counter, I got a giant aluminum paper cut. Fantastic. 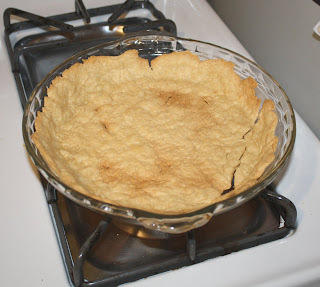 The first pie crust burned like an old lady in Del Boca Vista Phase II. I hardly ever use a timer, but this time I decided to use it and I successfully made a delicious flat bread appetizer for squirrels. Beauty, isn't it? In case you wanna keep score: Gremlin-1, Me-0. 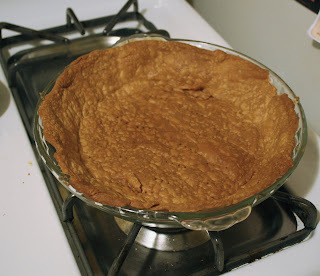 At this point, I'm running out of time (I still have to make corn casserole), so I use Pillsbury roll-out pie crust. Darn it if the thing didn't slide down my glass pie plate!!! That junk was an oily mess! I think my dish was too deep for it. I felt bad about throwing out another crust, so I baked it until beautifully golden brown and am thinking I'll make a pot pie or something. Looks like I'm 0 for 2. I'd finally had it and sent the hubster out to buy some fake pie crust shells. I ended up needing double the amount because those things are very puny and shallow. Anyhoo, it was about 1 in the morning and I was so tired of dealing with it, that I just tossed the shells into the oven. I forgot about pricking the bottom with a fork! Giant bubbles follow. Perfect. I was too annoyed to take a picture. Trust me, it wasn't pretty. Gremlin-3, Me-0. Next year we'll conquer those pies!